Creating a fact sheet for new hires can help them feel more connected to the team from day one. A new employee’s first day at work is more than just a day. It is the start of a journey with your company that could last decades if it is the right fit. That is why onboarding new employees the right way is so important. Right now we could point to thousands of articles that deal with this problem. And they all are written to help lessen the culture shock that those new hires feel. You may be thinking that a fact sheet will not make their first-day experience any easier. Wrong! From day one, or even before, the new hire will feel more familiar with the company with this sheet. 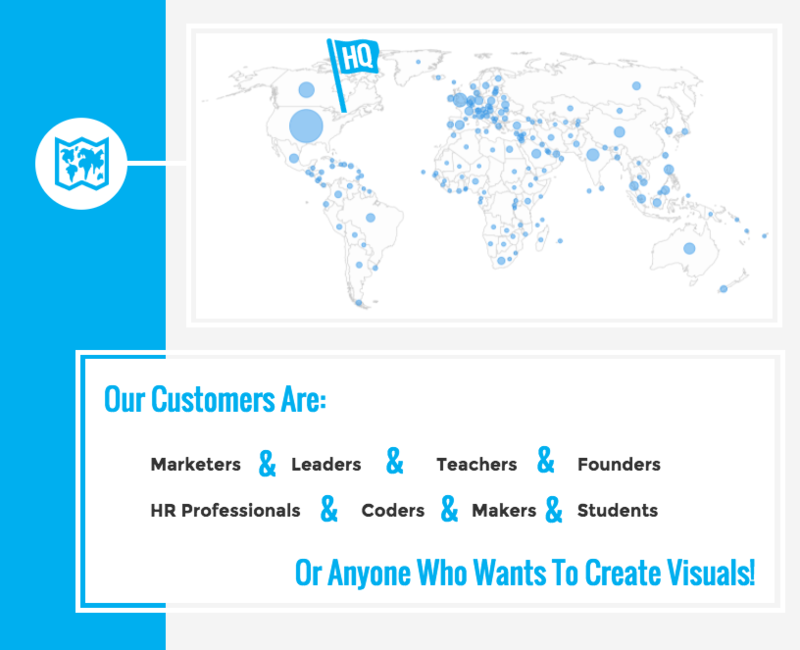 They will know the company’s mission statement, history, founders and other key information specific to their needs. After all, that’s what onboarding a new hire is all about! 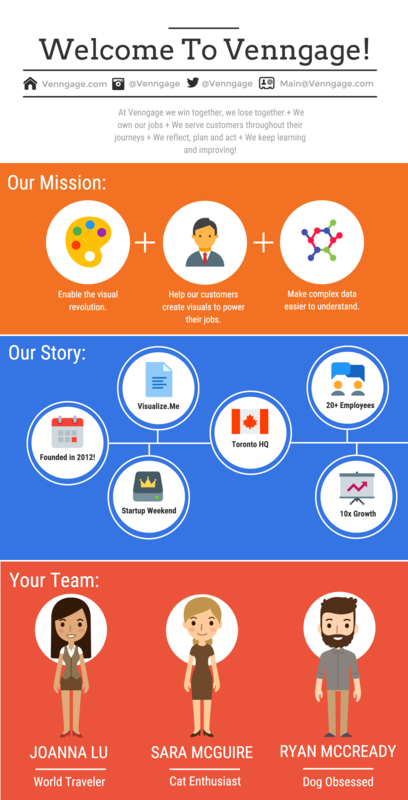 Add quick facts about your company. 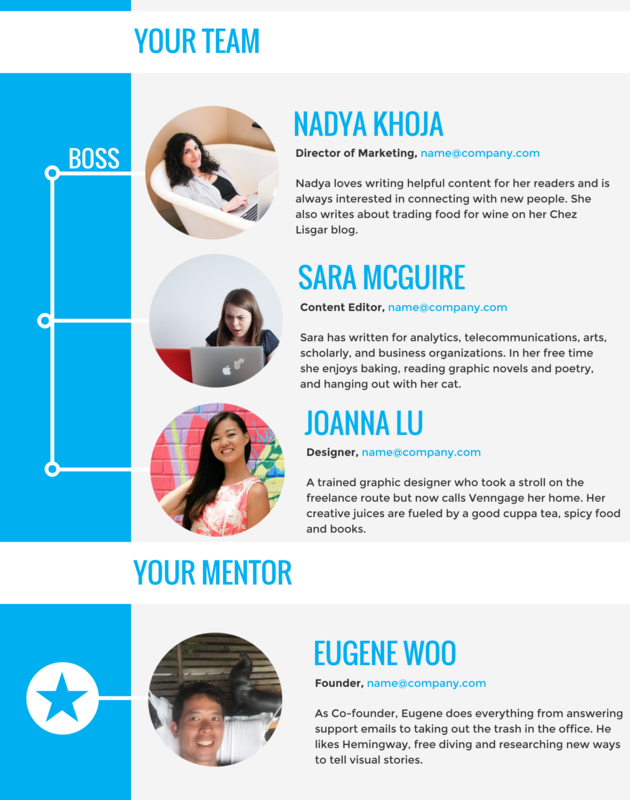 Introduce your new hire’s team members. Explain who your customers are. Add what drives your company to succeed. 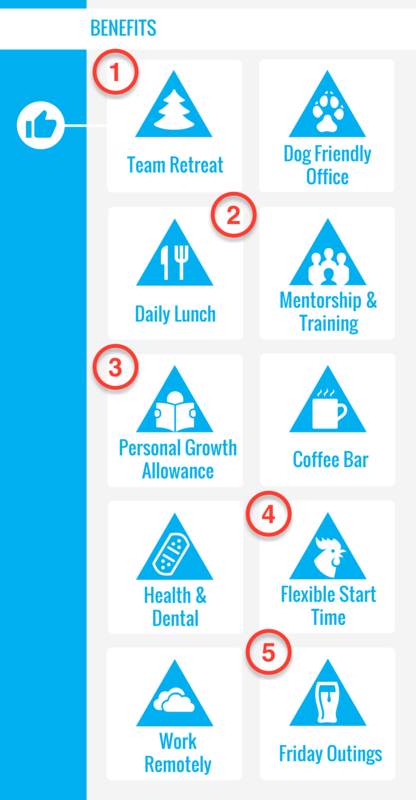 List your company’s benefits package. 1. Make a simple outline. Maybe the most important tip for new designers is to make a plan before starting any design work. Taking the time to sit down and plan something out goes against our fast-moving society, but it is worth it. Otherwise, you are setting yourself up for mistakes, unneeded frustration and wasted time. Trust me, I have had to it learn the hard way. 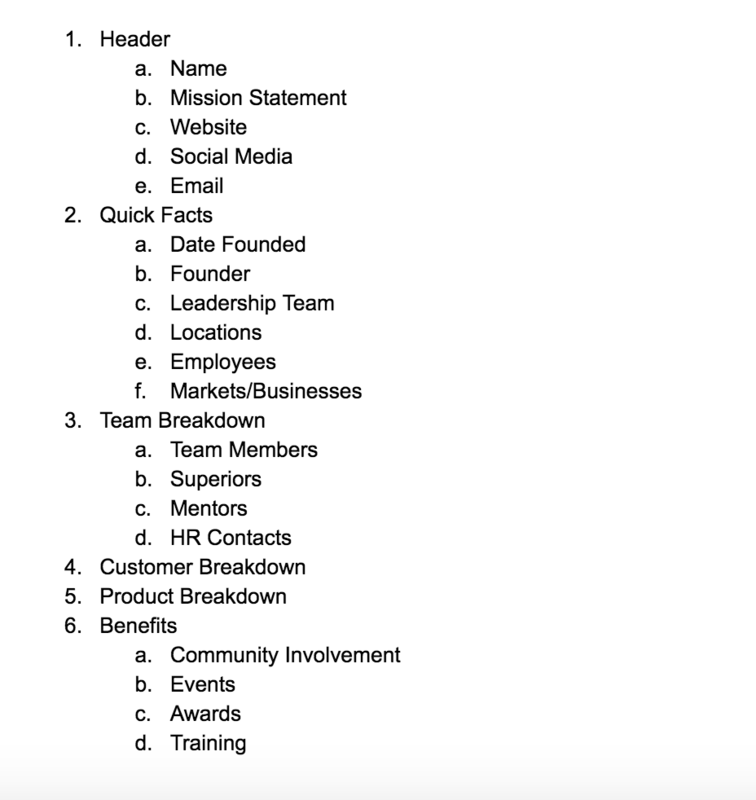 The plan for a new hire fact sheet should be the easiest one you will ever make. I mean it IS information about the company you work for! Therefore you should already know most of the important facts and details. This is only part of my plan, I also wrote out the things I would like covered under each of the individual bullet points. I would recommend filling out a full outline before starting on the design part of this fact sheet. It makes picking an infographic layout and theme that much easier. And again it will save you from some headaches later on! After you get the plan sorted it is time to pick a layout for your fact sheet! 2. 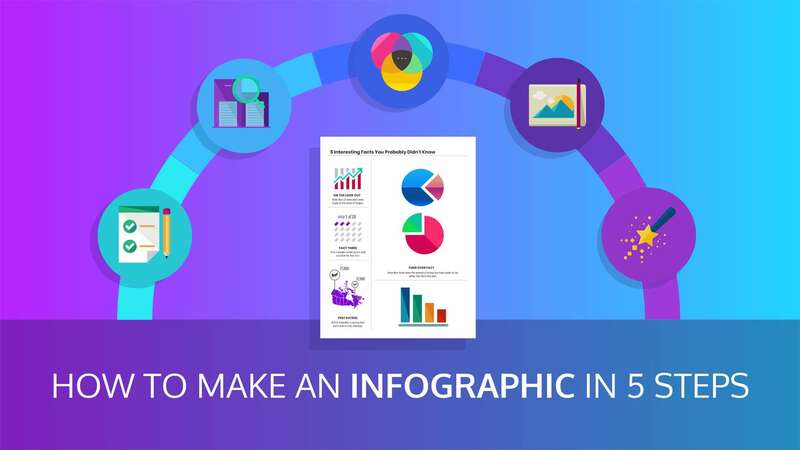 Choose an infographic template. 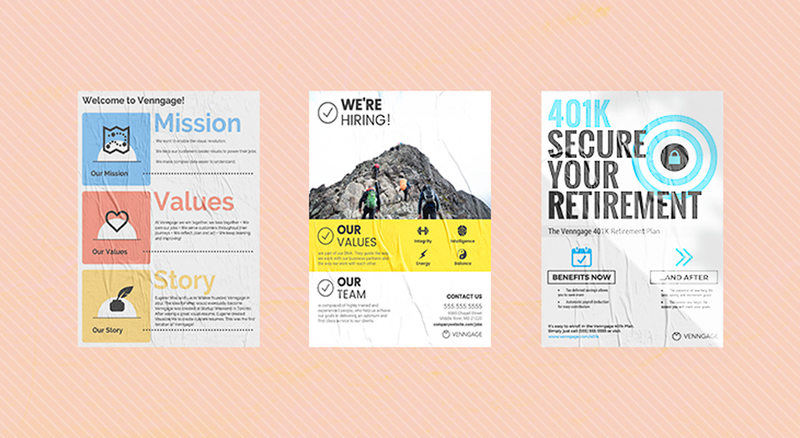 Once you have your plan in hand, you can pick out a perfect infographic template to fit your fact sheet. I would recommend using one of our templates and adapting it to your needs. Sometimes starting with a completely blank page can be overwhelming. But with a template, all of the hard decisions are already made. Oh, and all of the examples you see were created by me, a non-designer. So if I can create them, so can you! This was done in about an hour, and by using the plan I shared above,creating it was a cake walk. In addition to giving this sheet to new hires, you can also send it to your current employees or even the press, if needed! And it could be printed out as poster for the office! For more information on creating posters, check this out! The personal touch of including specific teammates should bring a smile to your new hire’s face, especially if you add them to the team. I did this by simply picking icons from Venngage’s library that look like my teammates. And make sure that whatever you do, your design is in line with your company brand and culture! 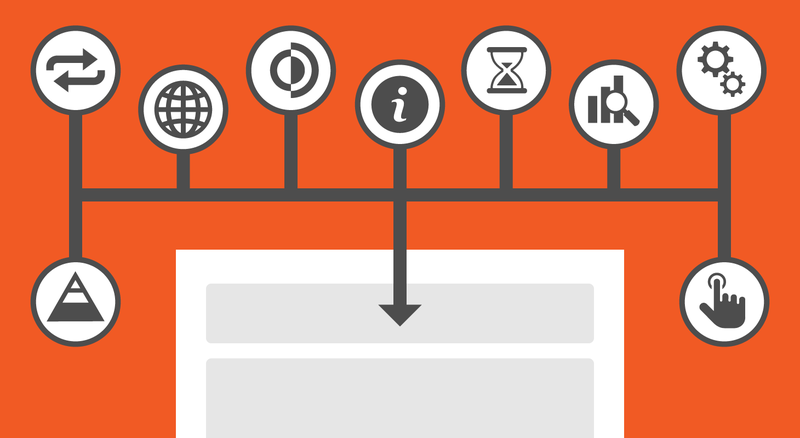 Now we can take a deep dive into creating the different components of a fact sheet! 3. Add the header information. 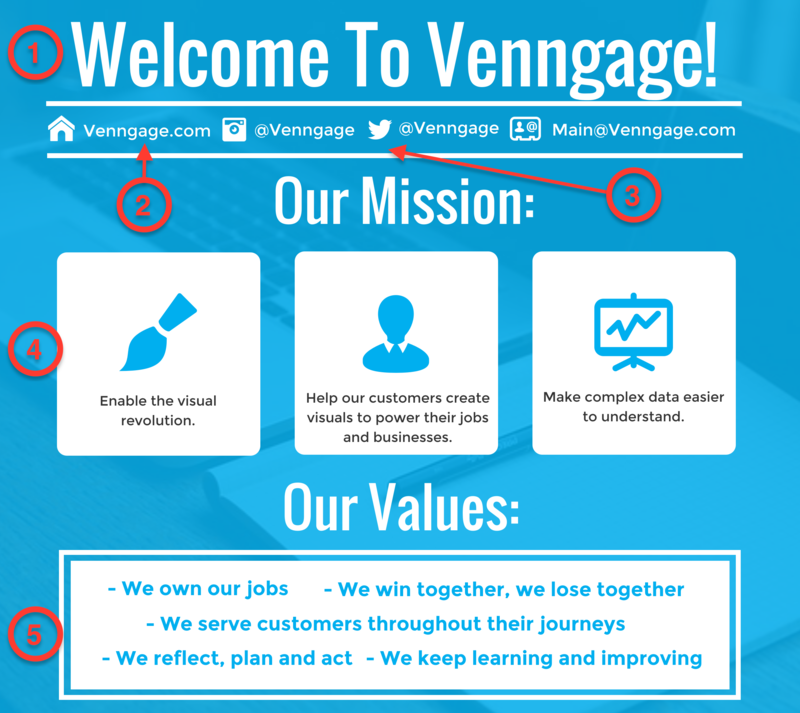 As you can quickly see, Venngage’s mission statement and values pop out immediately. 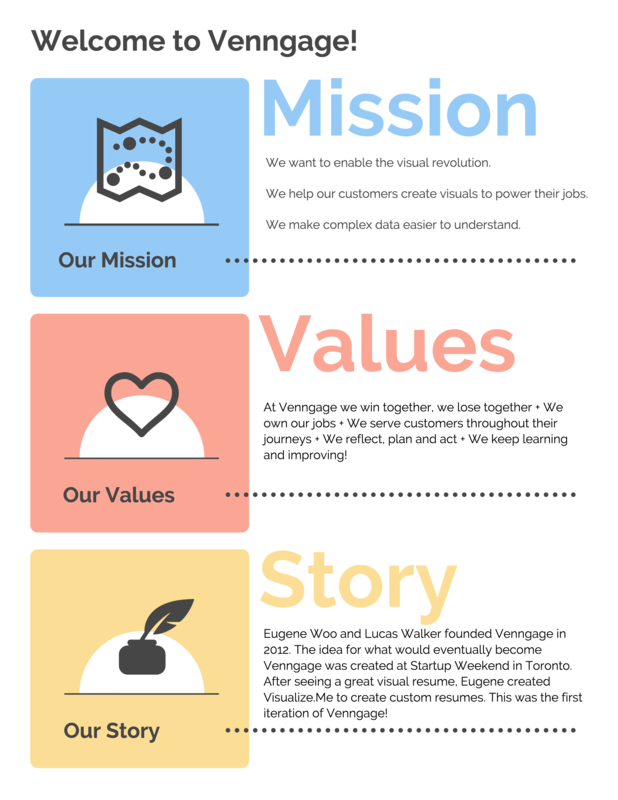 We want our new hires to know what our vision is and the impact we want to have on the world. With these two statements, you can establish a mindset that will stick with them during their career at your company. And it puts them on the same page as your current employees. Also, include things like your company’s main social network accounts or email, and give them a helpful reminder to follow those accounts. A welcome statement with your company’s name right at the top. You also may include the new employee’s name in this (“Welcome to Venngage, Jane!”). Your company’s website and any key email addresses. 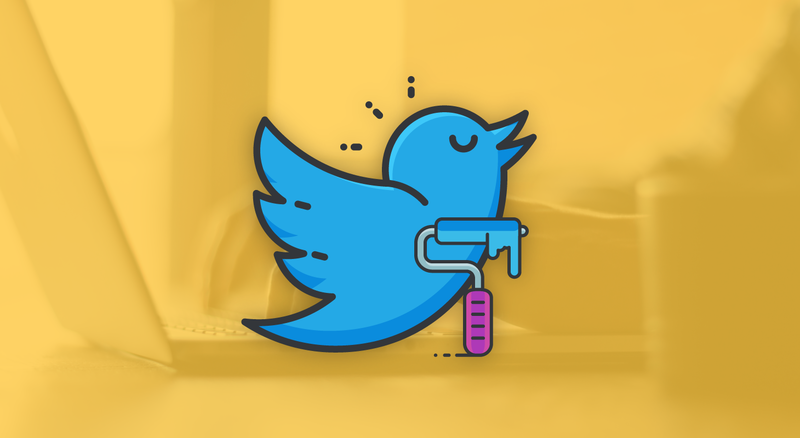 Social accounts that are relevant to your brand. our company’s mission statement. I believe that this is the most important part of the header! Key values that embody your team. Use “we” to encourage a feeling of inclusion. 4. Add quick facts about your company. Next, we are going to add the Quick Facts section, which offers a little background information about your company. It does not have to be the full history of your company, just some key information to give new hires context. Additionally, I included some facts about the team in this section. Like the fact that we are spread across the world and that our team has doubled in size over the past year. Include 5-10 important facts or memorable dates. Write a brief description for each fact; if they want to learn more they can ask! Pair relevant icons with each point. If you need help picking the right icons, check out this in-depth guide. 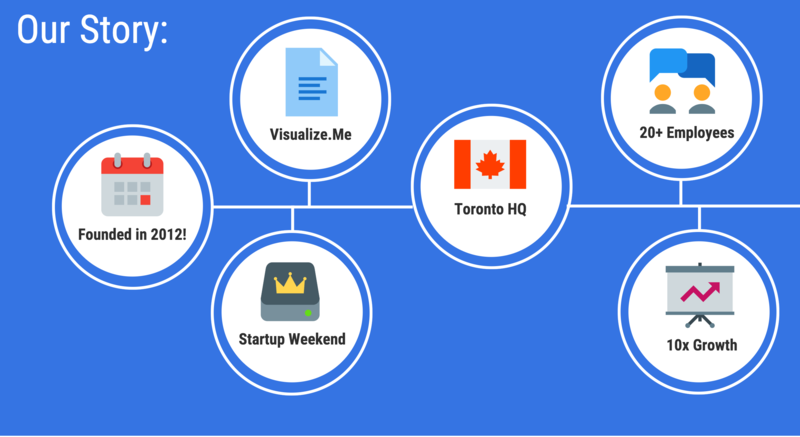 Organize the points into a timeline layout. If you want to learn more about timelines, read this! 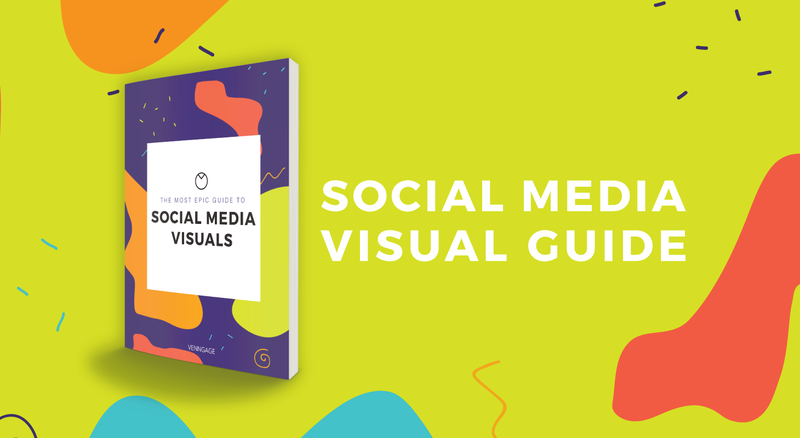 You can also easily crop this section and share it on social! 5. 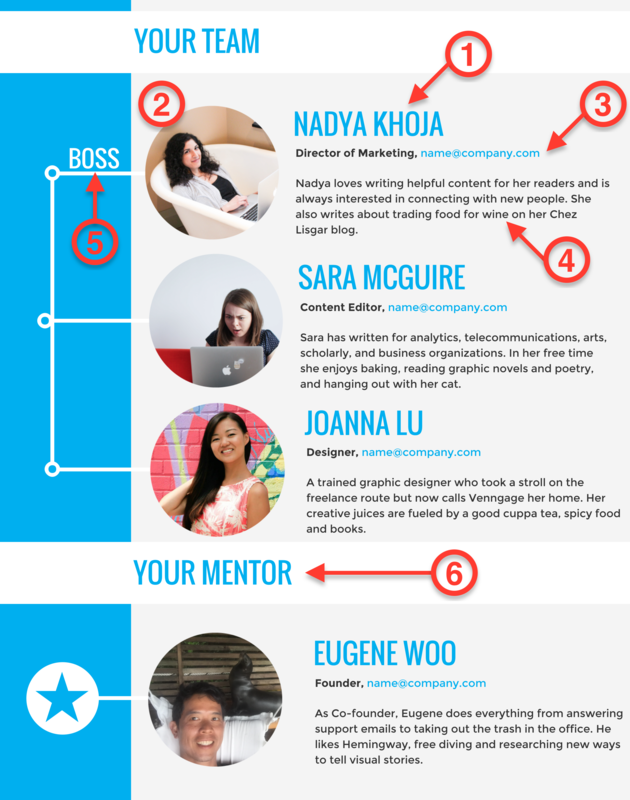 Introduce your new hire’s team members. During their first week, you probably introduce new hires to their immediate team Then you played a fun game or team building activity so everyone could meet the new employee. And finally, their boss introduced them to the rest of the company. But I am guessing meeting so many people can leave a new hire a little flustered. They most likely did not catch everyone’s name or any quirky facts about themselves that they shared. That is not your fault, it’s just an information overload! This is where adding a Team section to the fact sheet comes in handy. Additionally, if mentorship if part of your onboarding process, offer information about your new hire’s mentor. This is usually someone outside of their immediate team that can help become acclimated to their new job. Their position title and email address. A short bio of each employee. Specify who your new hire’s mentor is. 6. Explain who your customers are. 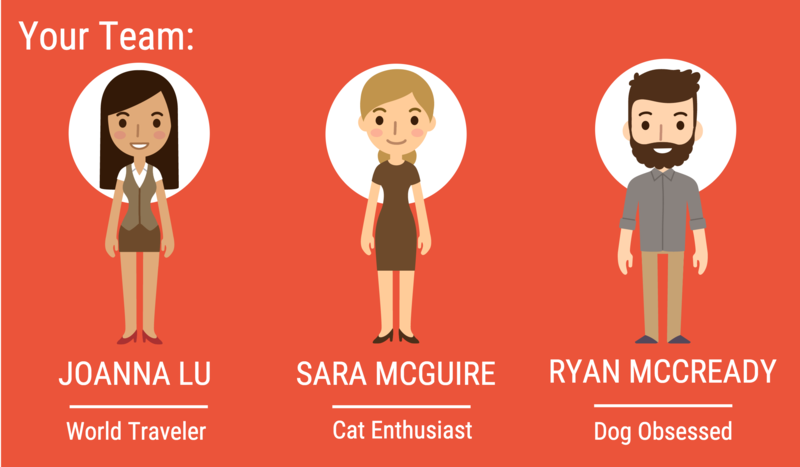 Include a Customer section to inform new hires about both who your customer base is and their role in helping those customers. This is a great place to use very inclusive language and make them feel like they are part of the team too. Show new hires that they are now an invaluable piece of solving problems for your customers. Now, in terms of breaking down your brand’s customer base, that is really up to you! But I would advise you to use try and make it as straightforward as possible. 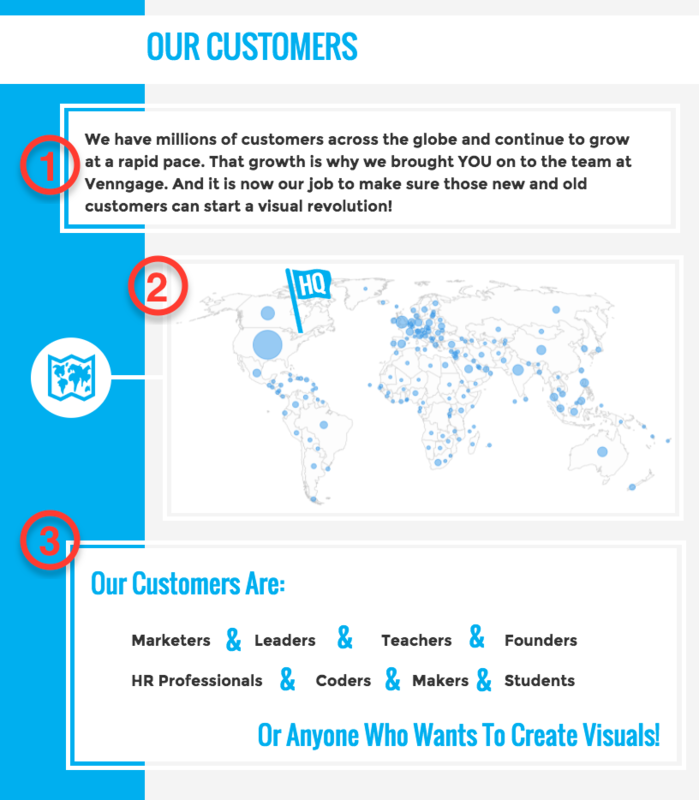 A map is a great way to visually represent your customer base. Offer an inclusive statement about why your new hire was brought onto the team. Also, inject some of your company culture and values into this statement. 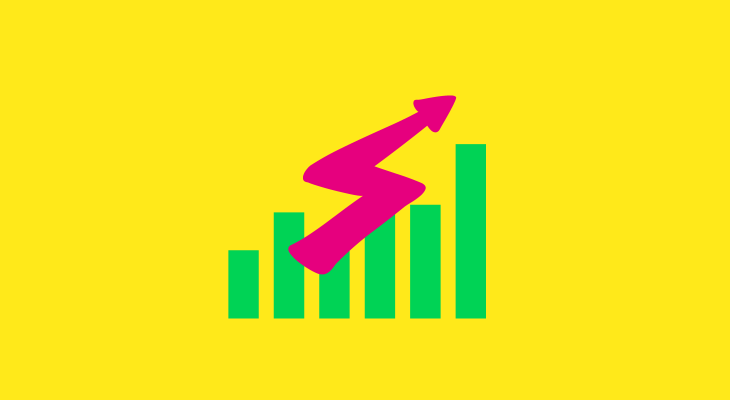 Add a graphical representation of your customer base. Specify who your customer verticals are. 7. Add what drives your company to succeed. 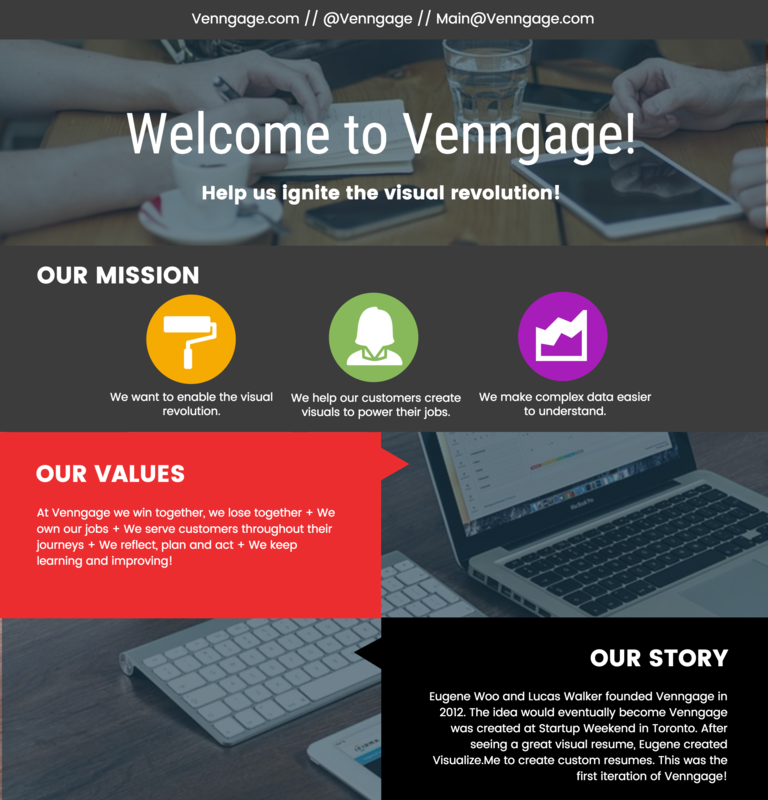 I took a very stripped down approach to this, clearly stating the problem that we have seen and how Venngage plans to fix it, using icons to anchor the design. This is not the place to be wordy, just get to the point and make it easy enough for your new hire to understand. This section can also be combined with the Customer Breakdown section if you want. They both overlap but we decided to have two sections to illustrate the fact sheet more effectively. Again this is up to your brand! 8. 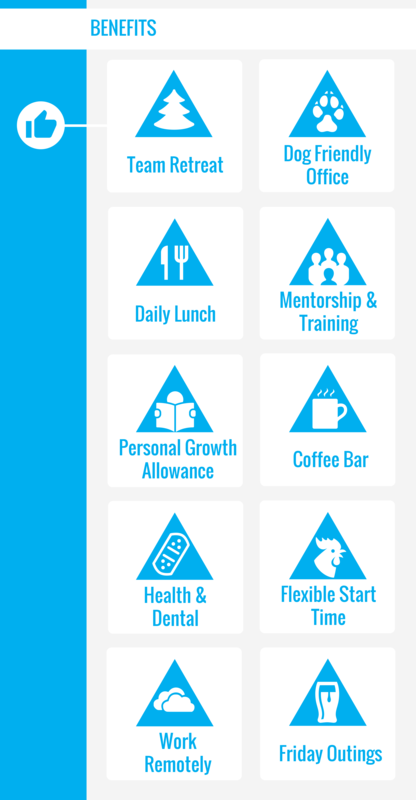 List your company’s benefits package. The last section covers something that employees will definitely want to know! Especially because benefits are one of the most important things that millennial workers look for in a company, more than any generation before them. I am guessing that during the hiring process, you let new hires know about the many benefits that you offer. So you may not need to list every benefit in this section that your company offers. But I would recommend using the Benefits section to reinforce some of your company’s best benefits. 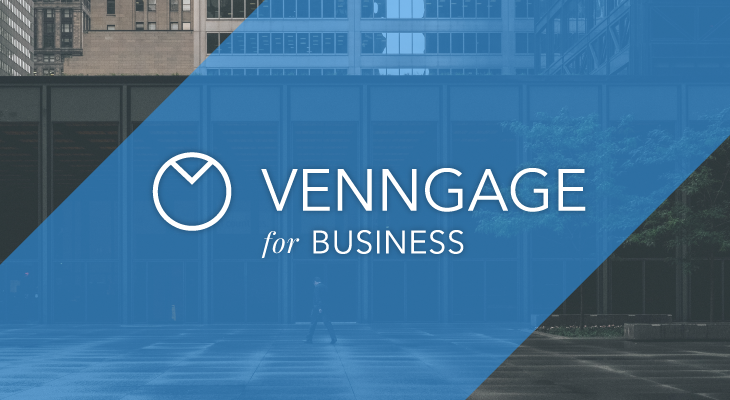 For example, I knew about the flexible hours and remote working options at Venngage before I started. Also that we were dog obsessed and they could come to the office with us. But I had no clue about the team retreat or the self-learning allowance. And both of those things have been awesome so far! The Benefits section can also be used to show how close-knit your team is, by including benefits like Friday Outings and Team Retreats. Small things like that will go a long way! Any team building trips or conference opportunities. Any food-related benefits like free lunches on Fridays (people love food). Any personal growth or learning opportunities. Any flexible or remote working options. Any other fun things that your team that new hires can look forward to! After you finish the Benefits section, that should about cover it! Unless there is any other company-specific information that you want to include. Here are a few guides on how to make sure your icons, color, and font selections are perfect too!